From time to time we like to ask our customers and partners about industry trends, how we are doing and what should we do next. 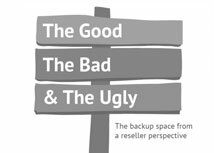 Recently we decided to ask our Macrium Valued Reseller partners for their views on the backup industry, challenges and changes. We were delighted to have over 120 resellers respond to our survey from 22 different countries around the globe. Over the last year we've been very busy recruiting more resellers to our global partner programme. We understand that our partners are trusted advisers with plenty of real world experience to draw on, and we wanted to find out a bit more about how our resellers work with their clients and understand the challenges they face. Overall we were delighted to discover that 89% of our resellers stated that Macrium was important or very important to their customers. In the survey we asked our resellers a variety of questions on the type of offerings they put to customers, data loss stories, how they would like to sell the licenses, what the impacts on their customers have been through data loss, and what did they think we should do next.